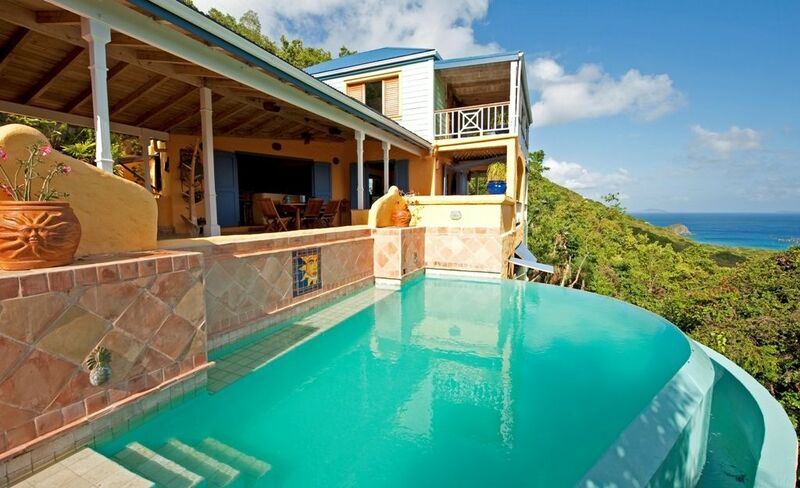 This fabulous villa is set high up in the prestigious Belmont Estate in the West End of Tortola British Virgin Islands. Limeberry House it is a designers dream with bright colors, Mexican tile, sun and moon sinks that wake you up even if you have been partying late at Bomba’s full moon shack! The West Indian style Villa nestles into the contours or the land, with bedrooms set in separate cottages maintaining maximum privacy. All bedrooms are air-conditioned. The house welcomes you with an open, airy feeling, the covered dining area which is the focal point of the house boasts an open plan gourmet kitchen, so no one is left out of the entertaining. A six burner Viking stove, stainless steel ice-making refrigerator and a dishwasher, complete this a gourmet kitchen. A short flight of steps brings you to Tamarind and Vanilla suites. Tamarind has its own private deck, complete with a tree growing through it and outside shower, all positioned to catch the cooling breezes of the Caribbean. Spectacular turquoise infinity pool offers breathtaking views over Long Bay and the Palm Grove, or with superb sunsets over Smuggler's Cove. Use the cocktail seat in the pool so you can watch the sun go down while sipping a rum punch. To the west of the house there is also a deck for alfresco dinning with a built in stainless steel BBQ stove. Here on fine evenings you can dine under the stars. Every detail in this custom home is a masterpiece of design; a collection of eclectic art adorn this property inside and out. Enjoy alfresco dining and spectacular sunsets. You get a choice of the 2 best beaches in the BVI Smugglers Cove and Long bay beach .Smugglers is a classic half moon beach and long bay is ideal for boogie boarding. The vIlla is set high up in the Lush private estate of Belmont has a panoramic view of long bay beach one of the best beaches in the BVI. First start with owner Jon Morley who offers guests impeccable service and tons of relevant knowledge about the island. Add the fact that this house is so well equipped, from high-end appliances to the laundry room and the best beach towels ever! Then sprinkle in the many beautiful views/spaces in the house to read, talk, eat meals, or just relax. It is a perfect recipe for an incredible vacation. We spent five short days here and did not want to leave. Upon our arrival we had a car organized for us, rotis in the fridge homemade by Pinky and a beautiful home waiting for us to ease into. Given we had small kids, the pool was the best! Thank you Jon, Pinky and Jude for making our vacation so memorable. You are awesome and we will be back! Our entire family along with an infant, stayed there for 10 nights and have to say that we all had a fantastic time. Everything was great and a high chair, crib and playpen and even a car seat were provided! All the rooms were very clean thanks to Pinky's hard work, beds super comfortable and the pool is fantastic. Jon is an exceptional host, always making sure everything was OK. Just love the place and look forward to our next stay! The owner is very responsive . He installed additional handrails just before we arrived to accommodate an elderly member of our party . He provides insiders tips on restaurants, excursions, shopping..everything. A former chef , he invited us to dinner one nite. His staff could not be nicer. The views and trade winds circulating through the house are extraordinary. The Limeberry villa was beautifully decorated in a tropical theme and was very open and airy. Jon was a wonderful host and touched base with us just before we flew to Tortola. He stopped in to ensure our stay was enjoyable and if we needed anything. The villa had a breathtaking view of Long Bay and Smugglers cove beaches. The villa offered a secluded and safe environment for a family holiday with lovely views. We had a wonderful stay at Limeberry Villa!! The house is absolutely gorgeous and perfectly appointed. The views are simply stunning and might be the best on the island! Jonathan is an excellent host and was so welcoming and accommodating. We can not recommend this villa highly enough!! It is the perfect house in an ideal location with gracious hosts! Thank you Jonathan and Pinky for an incredible stay!! We can’t wait for our next stay on our favorite island in our favorite villa!! Peaceful villa with amazing views! I loved my stay at Limeberry Villa! The villa has the most spectacular views on the island! Waking up every morning looking out at the sea and sailboats is so calming. No better way to greet the day! The villa is equipped with everything you need! The kitchen is a chefs dream. The rooms are spaced in a way that you have complete privacy and do not feel like you are in a house but at a resort. The beaches below are the best on the island. Limeberry Villa will not disappoint. I look forward to my next stay; can't wait to return! # people Low Season (Apr. 16- Dec. 14) High Season (Dec 15- Apr. 15) 1-2 $3,500 $6,300 3-4 $3,700 $6,500 5-6 $3,800 $6,700 7-8 $3,900 $6,900 Rates are weekly. Check in time is 3.00pm. Check out is 12.00 noon.